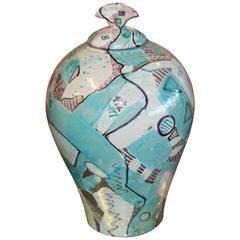 An impressive piece of pottery by the noted potter Mark Hines. It is extremely large. It is signed with an inventory number on the base. In generally good condition with some minor glaze imperfections and some minor nicks and scratches. 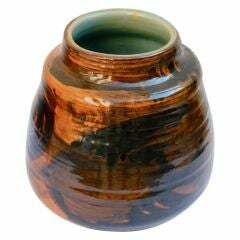 In generally age appropriate good condition with some minor glaze imperfections and some minor nicks and scratches. 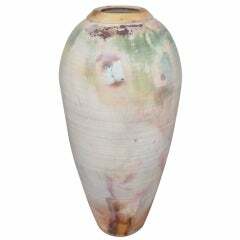 An incredibly impressive floor vase in a raku fired glaze that stands almost 40 inches tall. 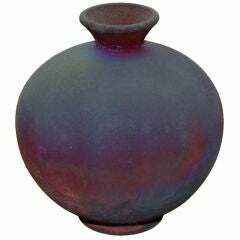 Nice color and glaze. Signed on the base what looks like M. Swenson. A pair of antique Wedgwood stoneware 2 handled pot pourri vases with pierced lids and liners decorated in applied sage green vine and leaf decoration.